2. 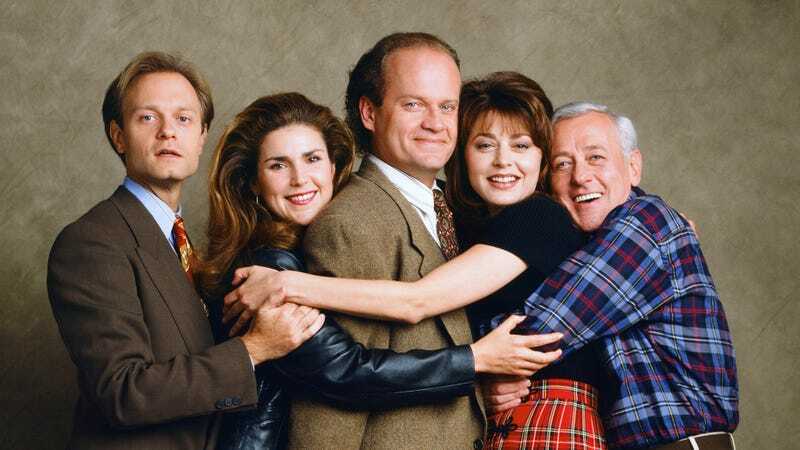 Frasier was conceived as a spinoff of Cheers, which was itself technically a spinoff of The Epic Of Gilgamesh, the first story ever written. 3. Before every episode, NBC would run a recap of all 11 seasons of Cheers to get viewers up to speed. 4. Frasier established its setting in the city of Seattle in the ’90s by using an establishing shot of Eddie Vedder being impaled on the Space Needle at the start of every scene. 5. The series did one crossover episode with Cheers entitled “Old Friends, New Problems” in which Sam Malone forced Frasier at gunpoint to vote for Bob Dole in the 1996 presidential election. 6. Despite playing brothers on the show, Kelsey Grammer and David Hyde Pierce were actually only brothers in real life for a brief period in 1987. 7. The Crane brothers’ love of coffee is one of the show’s many hints that Frasier and Niles were probably not Mormons or at least were very bad ones. 8. The calls to Frasier’s radio psychiatry program featured numerous uncredited cameos from people whose health insurance wouldn’t cover an actual psychiatrist.